Make a secure, online donation or send a check by mail. Click here. "Before my life was different – I didn’t have the communication with people who spoke English because I was fearful. I didn’t want to go place I didn’t know. At work, if someone wanted to talk to me, I couldn’t because I didn’t know how to have a conversation. I didn’t know how to read or write. All these things pushed me to want to learn English. Thanks to the Literacy Council, it is helping me to have a better position at work, have more opportunities in my life, and have more friends. When I go to the doctor for an appointment, I don’t need an interpreter because I understand what they say and we can talk about it. I can make appointments for my family over the phone. What has benefited me in my personal life – I have a better income. My job promoted me to kitchen manager. I want to keep learning more for my future." ​"My experience at the Literacy Council has been really good because I found nice people that make me feel important. They took the time to explain things to me carefully, slowly and with respect. When I was in school, I could write and read some but I had problems when it was time to speak. I felt like I stood out from the rest of the class because everybody could speak better than me. That did not make me feel good. When I first came to the Literacy Council, I did not think the small group class was for me and that I wanted something else but I was wrong. The class is what I need. It is very important for me to learn English because. I am the kind of person who likes to talk all day but feel frustrated when I can’t express what I want. My goal is to put 100% into my class because I am going to own my own company." BUSINESSES, THERE'S A ROLE FOR YOU! Supporting our mission with cash gifts and gifts-in-kind keeps the local workforce educated and families involved in civic life. Get the details. 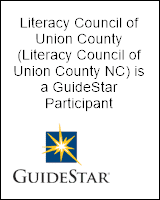 Link your Harris Teeter VIC card to Literacy Council of Union County. HT makes a cash gift to the Council based on what you spend, at no cost to you! GuideStar is the source of information about U.S. nonprofits. benchmark your nonprofit’s performance, research the sector, and more. To request a copy of our most current Form 990, please call the office.